22 x 30 minutes in High Definition. For years seniors had to accept slow paced boring exercise programs- not anymore! Not only are the locations unique but Curtis’ sincere compassion and charisma shine through as he instructs and motivates seniors to get up and to get moving. Every program is specifically designed for active seniors always keeping safety in mind. 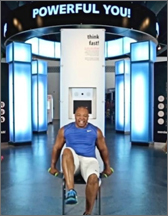 No one is left out, Curtis offers a modified version of every exercise so participants have the option to perform the exercises either seated or standing. At the end of every episode, a segment called A Minute of Wellness, allows the audience to take a front row seat while world-renowned specialists and medical experts share their wellness secrets and offer practical advice.